If you’re familiar with the dry-style stir-fries of Sichuan cuisine — Kung Pao chicken, or beef with cumin — this is its soupy antithesis. 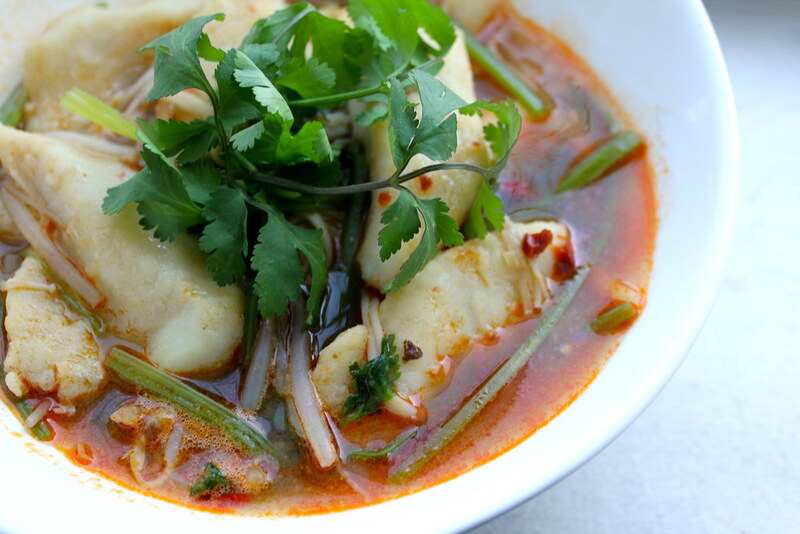 Translating literally to “water-cooked fish,” it’s fish slices gently poached in a not-so-gentle broth. No, it’s not just water in there. Infused with dried chilies, Sichuan peppercorns and chili bean sauce, it’s a tingly, vermilion bath loaded with slivered vegetables like cabbage and celery, flavors melding. And because of its stew-like consistency, it’s perfect for winter — or anytime you need a good kick in the seat of heat. Even though I’ve labeled this poached fish and veggies dish a “stew,” don’t think that it’ll take hours to cook. It doesn’t require a heavily reduced, fishy broth like other seafood stews might call for, and the minimally cooked, light-tasting vegetables are a refreshing complement to the intense broth. The slender pieces of fish fillets need only a couple minutes to cook through, and then it’s best served right away. More like a braise, this “water-cooked” method is also done with marinated slices of chicken, or pork. But we’re sticking with fish for now. I was asked to prepare a fish or seafood-based dish to a Sichuan potluck last weekend, and found myself making a gargantuan batch of this. Thinking that folks who’d signed up for a specifically Sichuan-themed dinner would be ready for — no, disappointed without — a good dose of spiciness, I really went for it with the Sichuan peppercorns and dried chilies. 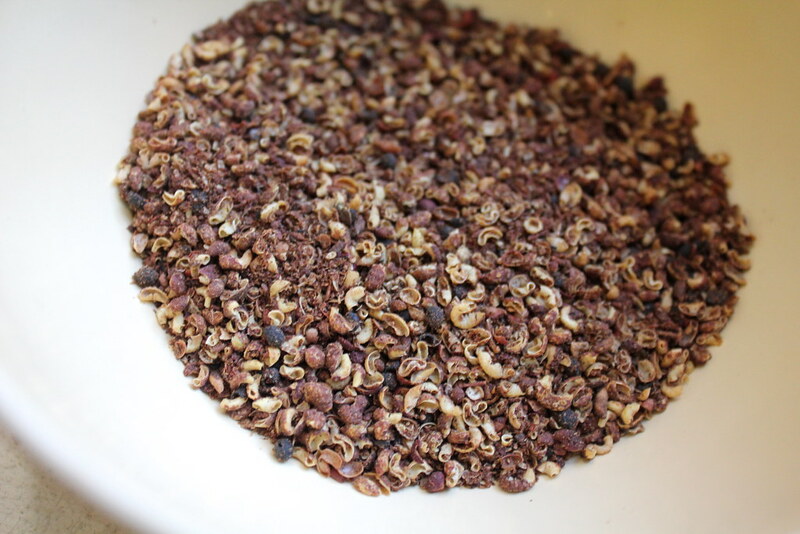 (When married, these two spices create a “numbing-hot” or ma-la effect that’s signature of Sichuan cuisine.) To develop the flavor of both these ingredients, each are first lightly toasted in a dry pan or wok. As soon as their fragrances fill the air, they’re taken out, and crushed coarsely. When it comes to crushing the chili flakes, your kitchen might become a bit hard to breathe in without coughing. But not to worry; this is perhaps the only difficult aspect about preparing the dish. Choose a white-fleshed fish fillet that’s the freshest you can get; these will be sliced and marinated in cornstarch to help the pieces stay intact. Still, I would hesitate to get an ultra-flaky fish, like flounder or trout, for fear of them falling apart. Stick with firmer types like cod. Catfish, farmed and imported from Asia under the name “basa,” is often mentioned in recipes for Shui Zhu Yu, if any specific fish is. 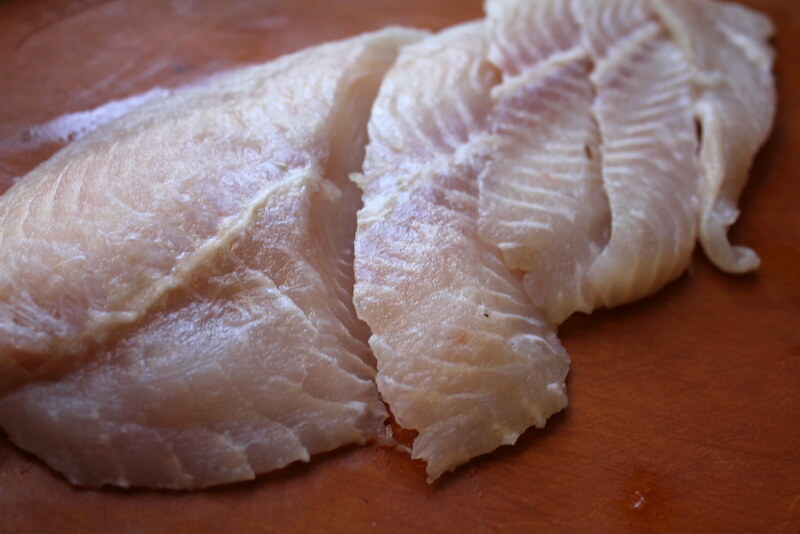 You can find US-farmed catfish easily, which is a great substitute. The shredded vegetables are also variable; thin slivers of Chinese celery are customary, and really add a nice, savory dimension to the broth. Last weekend, I decided to combine that with thin, slippery enoki mushrooms and crisp bean sprouts for a range of texture. Shredded napa cabbage is usually tossed in here, too, but I saw that someone else was going to be bringing a cabbage dish to the Sichuan potluck, and skipped it this time around. Other classic additions might be thin slivers of bamboo shoots, carrots, leeks or scallions, other types of mushrooms, other leafy greens. Just be sure to garnish the finished bowl with a fresh cilantro sprigs for a really crisp, fragrant touch. That might help soften the tinge of crushed Sichuan peppercorn floating throughout. Pat the fish slices dry with paper towels. Place flat on a cutting board and slice along its length on a bias to evenly-sized pieces no thicker than an inch in width. Coat the pieces with the cornstarch and a generous couple pinches of salt. Mix thoroughly by hand. Cover and chill for at least 15 minutes. Heat a skillet or wok over medium-high heat. Add the Sichuan peppercorns and let sit for 30 seconds. Shake the pan occasionally for the next 30 seconds to a minute, or until fragrant. Remove from heat and set aside in a bowl. Remove the stems from the whole chilies and add to the hot pan. Shake occasionally for 30 seconds to a minute, or until fragrant. Remove from pan and set aside. 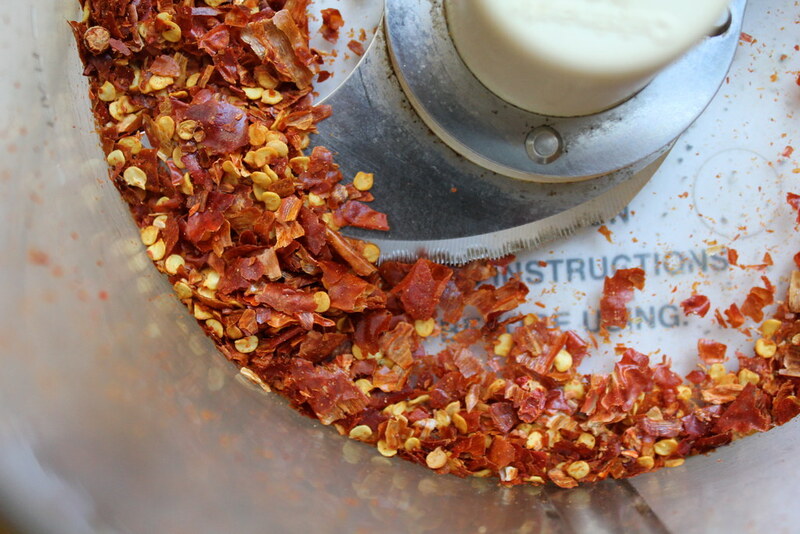 Once cooled slightly, coarsely crush the peppercorns in a spice grinder, food processor, or mortar and pestle. Set aside. 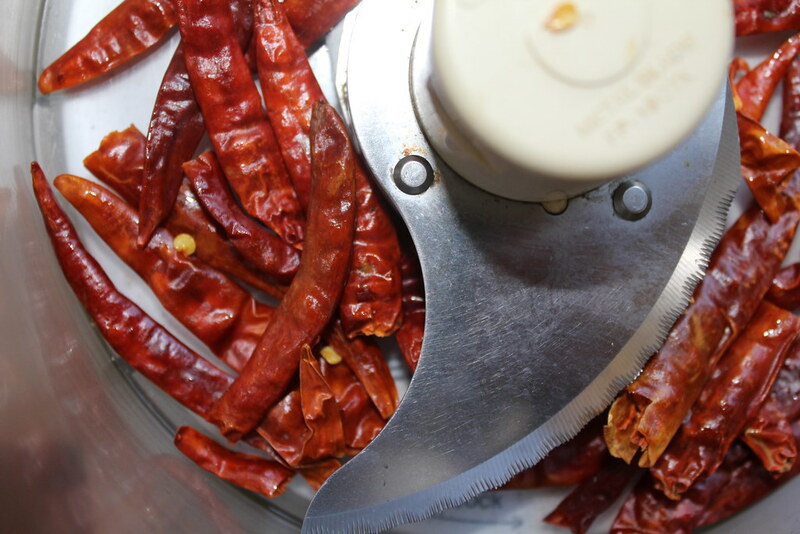 Next, coarsely crush the toasted and cooled chilies in a spice grinder, food processor or mortar and pestle until the pieces are coarse crumbs. Heat the 4 tablespoons of oil in a medium-large pot or Dutch oven. Add the garlic and crushed chilies and cook, stirring occasionally, over medium-low heat until very fragrant. Add the chili bean sauce and cook another few seconds, stirring. Add the water and stir. Increase heat to high and bring just to a boil. Add the cabbage, mushrooms and bean sprouts. Reduce to a simmer and cook, stirring occasionally, 10 minutes. Bring again to a steady boil and drop in the fish slices. Stir immediately to prevent them from sticking. Retain a steady boil, reducing heat if broth begins to bubble rapidly. After 2 minutes, add the celery and scallions. Cook another 2-3 minutes, boiling and stirring occasionally, and season broth to taste with salt and white pepper to taste. Transfer to a deep serving dish or bowl (or individual bowls). Garnish with a generous sprinkle of the crushed Sichuan peppercorns, followed by the fresh cilantro. Serve immediately. Four brownie points: For such a robustly flavored main course, this dish is pretty lean thanks and has a good ratio of veggies to protein. Thanks to the virtues of “water-cooking,” excessive oils are not necessary, although in this case, they add flavor when infused with the chilies and garlic. Serve with some brown rice to make for a hearty meal. Five maple leaves: To make this authentic-tasting Sichuan dish, I used plenty of imported ingredients: chilies, peppercorns, bean sauce, and the out-of-season, non-local cilantro, celery and scallions. 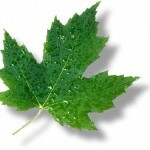 At least cabbage is found in the dead of winter, and any type may be replaced with napa cabbage. US farmed catfish is rated a “Best Choice” by Seafood Watch, thanks to more responsible farming methods, so look out for it when making choices at the seafood market. First off, thanks so much for sharing this blog! As a fellow New Yorker I am so encouraged and inspired to eat in more. My question is: where do you like shopping for Asian ingredients (in this instance Chinese/Sichuan)? Thanks! I will definitely try this recipe! It looks so delicious and I really like fish. Thank you for sharing.